Background: Symptoms of chronic obstructive pulmonary disease (COPD) may diminish patients’ health-related quality of life (HRQoL). We report effects of Longhala™ Magnair™ (glycopyrrolate) Inhalation Solution, a drug/device combination of the long-acting antimuscarinic glycopyrrolate administered using the eFlow® closed system (eFlow CS) nebulizer, on HRQoL from the Glycopyrrolate for Obstructive Lung Disease Via Electronic Nebulizer (GOLDEN) clinical studies. Methods: Data consisted of a pooled analysis of 2 phase 3, 12-week efficacy studies (GOLDEN-3 and -4) of glycopyrrolate/eFlow CS (25 or 50 mcg twice daily [BID]) versus placebo, and a 48-week, open-label safety study (GOLDEN-5) of glycopyrrolate/eFlow CS 50 mcg BID versus tiotropium 18 mcg once daily in patients with moderate to very severe COPD. Change from baseline in HRQoL was measured via the St George’s Respiratory Questionnaire (SGRQ). Results are provided as mean changes in SGRQ Total score and as response analysis (≥4-point improvement [responder], no change, and ≥4-point worsening in Total score) using analysis of covariance or logistic regression, as applicable. Results: A total of 1293 patients were evaluated from GOLDEN-3 and -4 and 1086 from GOLDEN-5. Glycopyrrolate/eFlow CS significantly improved SGRQ Total and component scores. 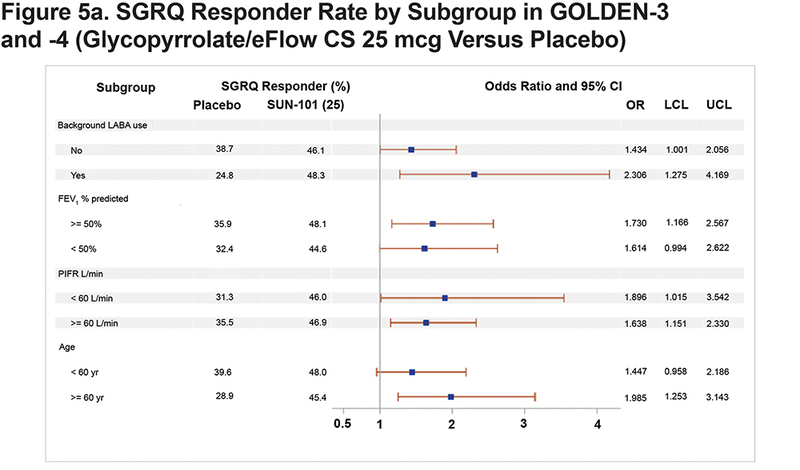 The percentage of SGRQ responders in pooled GOLDEN-3/4 was 46.8% for glycopyrrolate/eFlow CS 25 mcg, 41.7% for glycopyrrolate/eFlow CS 50 mcg, and 34.5% for placebo. SGRQ Total and component score improvements were similar between glycopyrrolate/eFlow CS and tiotropium in GOLDEN-5. Conclusions: The drug/device combination of glycopyrrolate/eFlow CS significantly improved HRQoL, as measured by the SGRQ, offering a potential maintenance treatment option in patients with moderate to very severe COPD. Funding Support: Sunovion Pharmaceuticals Inc., provided funding for this research. 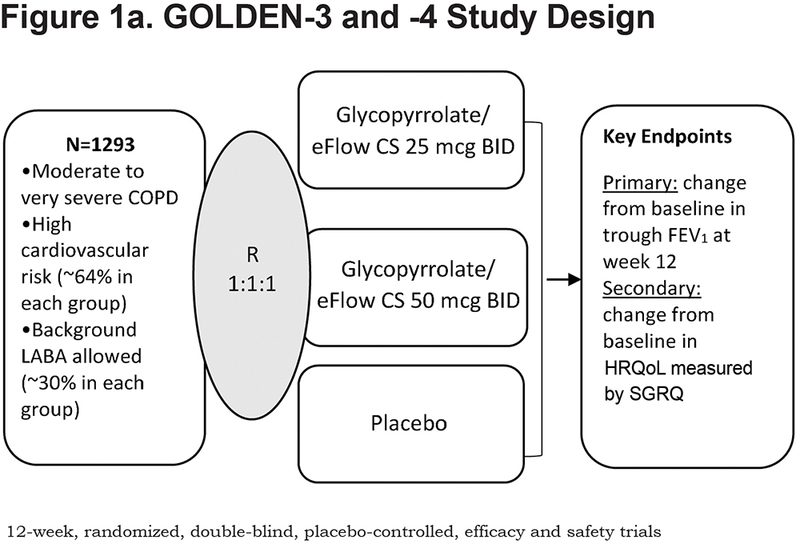 Glycopyrrolate/eFlow CS was evaluated in 3 pivotal studies in patients with moderate to very severe COPD, known as the Glycopyrrolate for Obstructive Lung Disease Via Electronic Nebulizer (GOLDEN) trials. GOLDEN-3 and GOLDEN-4 were phase 3, randomized, double-blind, placebo-controlled, 12-week studies of glycopyrrolate/eFlow CS versus placebo. GOLDEN-5 was a 48-week, randomized, open-label, parallel-group safety study of glycopyrrolate/eFlow CS versus tiotropium. Efficacy and safety data of glycopyrrolate/eFlow CS from the individual studies have been reported elsewhere.29,30 In this article we report findings from all 3 GOLDEN studies regarding the impact of glycopyrrolate/eFlow CS on HRQoL as measured by the St George’s Respiratory Questionnaire (SGRQ). 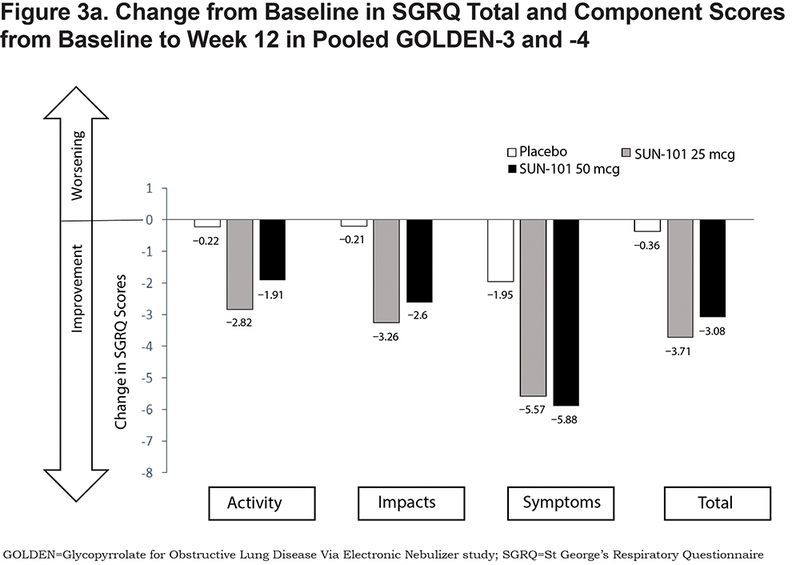 While analyses of SGRQ from the pooled GOLDEN-3 and -4 studies will show the impact of nebulized glycopyrrolate on HRQoL versus placebo at the 12-week time point, analyses of GOLDEN-5 data were aimed at evaluating consistency of the HRQoL effect of treatment at multiple visits over 48 weeks and to compare the HRQoL impact of this new treatment with an already established LAMA drug, tiotropium. Patient-reported HRQoL data are from a pooled analysis of the pivotal GOLDEN-3 (NCT02347761) and GOLDEN-4 (NCT02347774) studies, and a separate analysis of the long-term GOLDEN-5 study (NCT02276222). All procedures followed the Declaration of Helsinki and received institutional review board approval. All patients or their legal representatives gave written, informed consent. 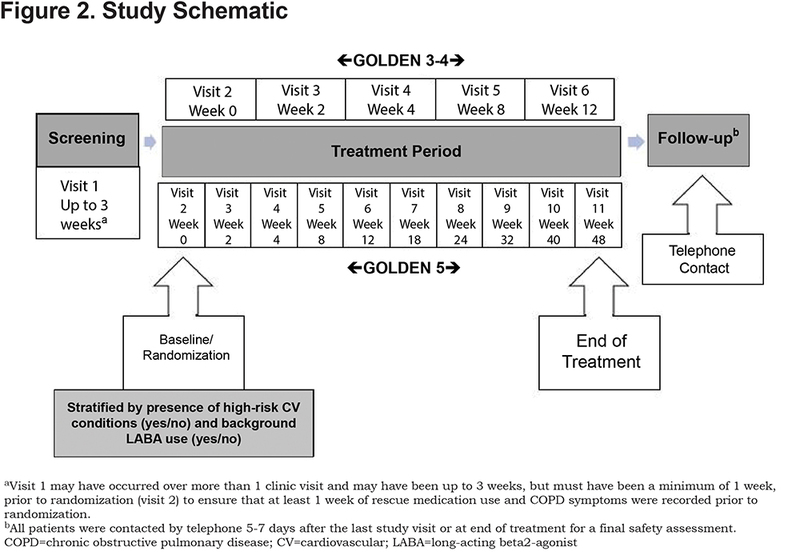 Patient criteria for the GOLDEN studies have been previously presented.27,29 Briefly, patients ≥40 years of age, with moderate to very severe COPD per the 2014 report of the Global Initiative for Chronic Obstructive Lung Disease (GOLD)31 and who were current or former smokers with a smoking history of ≥10 pack years were included. Pulmonary function required at screening included post-bronchodilator (following inhalation of ipratropium bromide 68 μg; 4 puffs of 17 μg) forced expiratory volume in 1 second (FEV1) of <80% of predicted normal and >0.7 L, and FEV1/forced vital capacity (FVC) ratio <0.70. Patients were excluded from the studies if they had a history of or current unstable cardiac disease or long QT syndrome, clinically significant respiratory disease other than COPD, and recent history of COPD exacerbation requiring hospitalization or need for increased treatments for COPD within 6 weeks prior to screening. Design of the GOLDEN studies are presented in Figures 1a and 1b. The inclusion of patients with very severe disease (post-bronchodilator FEV1% predicted <30%) and those with a history of cardiovascular (CV) disease (including hypertension, ischemic heart disease, cerebrovascular disease, peripheral arterial disease, clinically significant arrhythmia, and heart failure) was permitted to reflect the general COPD population. Background LABA therapy was allowed in up to 30% of patients in GOLDEN-3 and -4 and with no limit in GOLDEN-5. Following an initial screening period, patients were randomized (using a web/voice interactive response system) 1:1:1 to glycopyrrolate/eFlow CS 25mcg twice daily (BID), glycopyrrolate/eFlow CS 50mcg BID, or placebo BID in GOLDEN-3 and -4, and 4:3 to glycopyrrolate/eFlow CS 50mcg BID or tiotropium 18mcg once daily (via HandiHaler™) in GOLDEN-5 (Figure 2). Glycopyrrolate/eFlow CS and placebo were administered daily in the morning and evening. Tiotropium was administered daily in the morning. In GOLDEN-3 and -4, patients, investigators, site staff, and the study sponsor were blinded to all treatments during the treatment period. An albuterol metered-dose inhaler (MDI) was provided to all patients and permitted as rescue medication for as-needed use any time during the study assessments; in the case of continued symptom exacerbation, a supplemental ipratropium bromide MDI was provided. Other LAMAs or short-acting bronchodilators were not permitted. High CV risk was defined as patients with pre-existing diagnosis of ischemic heart disease, cerebrovascular disease, peripheral arterial disease, hypertension, clinically significant arrhythmia, and/or heart failure. 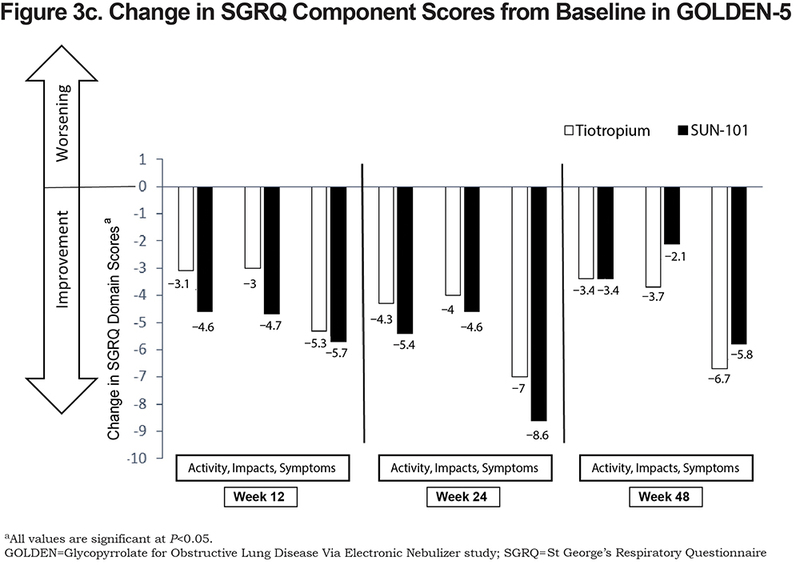 The SGRQ is a validated, COPD-specific patient-reported outcome instrument designed to measure and quantify the impact of disease on HRQoL in patients with chronic airflow limitation. The SGRQ consists of 50 items that yield a Total score (effect of disease on overall HRQoL) based on a sum of the total number of items, as well as 3 component scores: Symptoms (frequency and severity of respiratory symptoms), Activity (disturbance or limitations to daily physical activities), and Impacts (psychosocial function disturbances due to airway disease). Scores range from 0 (no impairment) to 100 (maximum impairment).32 The minimum clinically important difference (MCID) is a general threshold used to determine whether an intervention provides a clinical benefit.33 The MCID for the SGRQ is a 4-point improvement (reduction) in Total score.34 A key secondary efficacy endpoint in the GOLDEN studies was change from baseline in SGRQ score (Figures 1a and 1b). SGRQ assessments were conducted at baseline (week 0) and at week 12 in GOLDEN-3, ‑4, and -5. The SGRQ was also assessed at weeks 24 and 48 in GOLDEN-5. Assessments were completed at the end of treatment for patients who were unable to complete the study. Change from baseline in SGRQ Total score and each component score were analyzed using analysis of covariance, with change from baseline as the response variable and with factors for treatment group, high-risk CV comorbidities (yes/no), background LABA use (yes/no), and baseline score as covariates. Baseline scores for each SGRQ component and Total score were calculated from the latest SGRQ assessment taken prior to the first dose of study medication. Proportion of responders on SGRQ Total score was defined by MCID criteria (≥−4-unit change from baseline). SGRQ response was further analyzed to include patients with no change (−4 < change <4) and worsening of Total score (≥4-point increase). The odds ratio for response was determined using a logistic regression model. 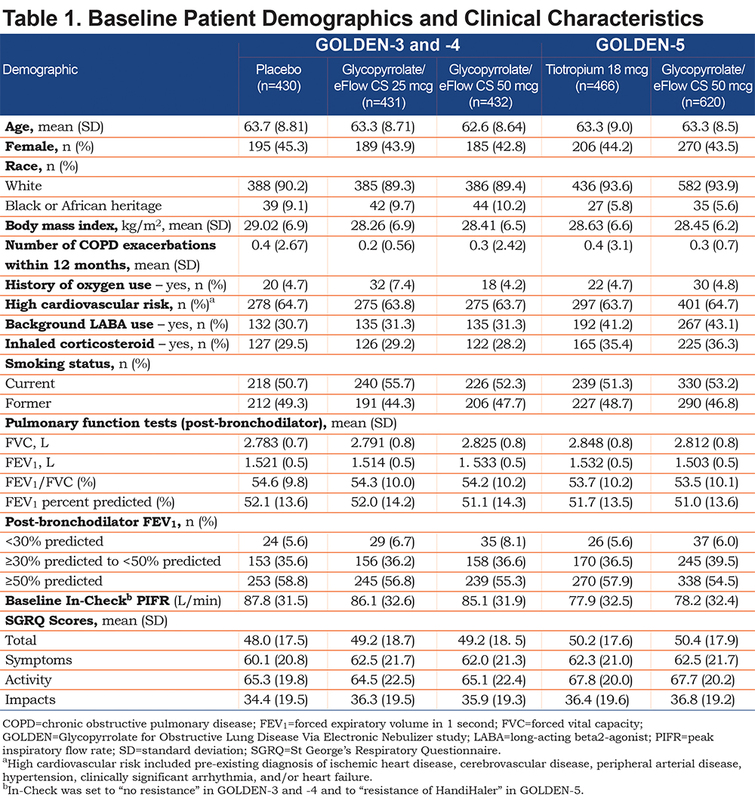 In GOLDEN-3 and -4, responders were also evaluated by subgroups: age (40-50, ≥65, <65, ≥75), post-bronchodilator FEV1% predicted (<50% and ≥ 50), In-Check™ PIFR (≥ 60 L/min and < 60 L/min), and background LABA use (yes or no). For the pooled GOLDEN-3 and -4 data, results presented are for the intent-to-treat population using on-treatment data (from first date of study drug to last date of study drug). GOLDEN-5 was a safety study; therefore, results are presented from the intent-to-treat population in all patients who were randomized to treatment and received at least 1 dose of study medication. The alpha level for these analyses was set at 0.05 without adjustment for multiplicity and all analyses were conducted using SAS 9.3 (SAS Institute, Cary, North Carolina). In GOLDEN-3 and -4, a total of 1293 patients were randomized to either glycopyrrolate/eFlow CS 25mcg (n=431), glycopyrrolate/eFlow CS 50mcg (n=432), or placebo (n=430). The proportions of patients who completed the studies were 91.9% (n=396), 92.6% (n=400), and 88.1% (n=379) for glycopyrrolate/eFlow CS 25mcg, glycopyrrolate/eFlow CS 50mcg, and placebo, respectively. As shown in Table 1, a majority of patients were white (89.6%), current smokers (52.9%), and had ≥1 high-risk CV condition at baseline. Mean baseline SGRQ Total scores were similar among treatment groups and indicated high symptom burden and poor COPD-related health status in these groups (glycopyrrolate/eFlow CS 25mcg: 49.25, glycopyrrolate/eFlow CS 50mcg: 49.24, and placebo: 48.02; Table 1). In GOLDEN-5, a total of 1086 patients were randomized to the glycopyrrolate/eFlow CS (n=620) and the tiotropium (n=466) groups. The proportion of patients who completed the study were 70.3% (n=436) and 86.3% (n=402) in the glycopyrrolate/eFlow CS and tiotropium groups, respectively. Baseline patient characteristics were similar to those observed for the sample from the pooled efficacy studies (Table 1). Mean baseline SGRQ Total scores were similar in the glycopyrrolate/eFlow CS (50.38) and tiotropium (50.17) groups (Table 1), indicating high symptom burden and poor HRQoL at baseline. 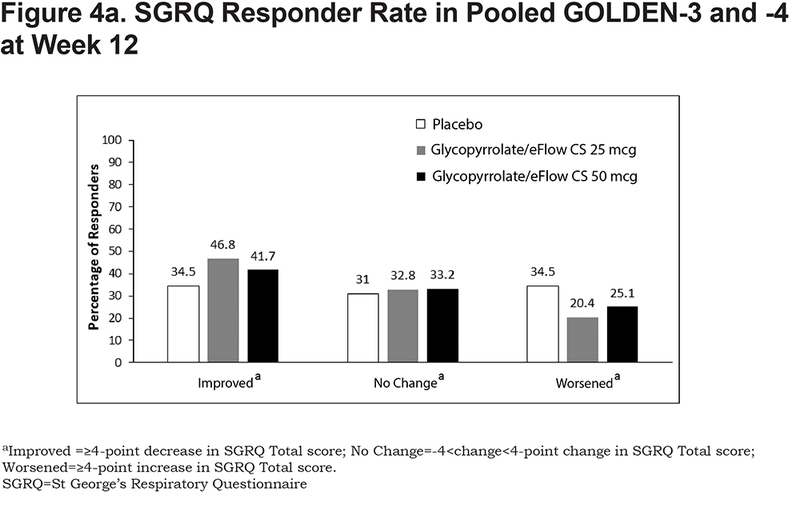 In GOLDEN-3 and -4, statistically significant improvements in SGRQ Total score were observed in patients receiving glycopyrrolate/eFlow CS (Figure 3a). Mean change at week 12 from baseline in Total score was greater for both glycopyrrolate/eFlow CS 25mcg (least squares [LS] mean, −3.71; 95% confidence interval [CI]: −4.85, −2.57) and 50mcg (−3.08; −4.23, −1.93) than placebo (−0.36; −1.52, 0.79) as shown in Figure 3a. The improvements in Total score for both glycopyrrolate/eFlow CS groups relative to the placebo group were statistically significant (placebo-adjusted LS mean changes from baseline; 95% CI: 25mcg, −3.35; −4.90, −1.79; 50mcg, −2.71; −4.28, −1.15). Statistically significant improvements were also seen in the Symptoms, Impacts, and Activity component scores for patients treated with glycopyrrolate/eFlow CS as compared with placebo (Figure 3a). Mean changes at week 12 from baseline in the Symptoms component were greater for both glycopyrrolate/eFlow CS 25mcg (LS mean, −5.57; 95% CI: −7.24, −3.9) and 50mcg (−5.88; −7.56, −4.2) than with placebo (−1.95; −3.64, −0.27). The improvements in the Symptoms component with both glycopyrrolate/eFlow CS groups compared with the placebo group were statistically significant (LS mean difference versus placebo; 95% CI: 25mcg, −3.62; −5.9, −1.34; 50mcg, −3.93; −6.2, −1.65). Improvements from baseline to week 12 were also observed for glycopyrrolate/eFlow CS in the Impacts component (LS mean; 95% CI: 25mcg, −3.26; −4.52, −1.99; 50mcg, −2.6; −3.87, −1.33; placebo, −0.21; −1.49, 1.08); the mean change in scores for both glycopyrrolate/eFlow CS groups was significant compared with the placebo group (LS mean difference versus placebo; 95% CI: 25mcg, −3.05; −4.78, −1.33; 50mcg, −2.40; −4.12, −0.67). Patients in the glycopyrrolate/eFlow CS groups also experienced improvements at week 12 from baseline in the Activity component (LS mean; 95% CI: glycopyrrolate/eFlow CS 25mcg, −2.82; −4.33, −1.31; 50mcg, −1.91; −3.43, −0.40 placebo, 0.22; −1.31, 1.75), which were also significant for both glycopyrrolate/eFlow CS groups when compared with the placebo group (LS mean difference versus placebo; 95% CI: glycopyrrolate/eFlow CS 25mcg, −3.04; −5.10, −0.98; 50mcg, −2.13; −4.19, −0.07). 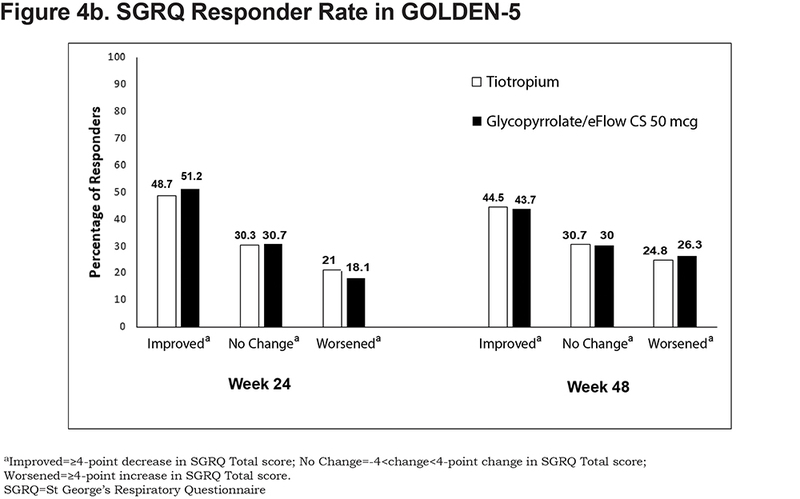 In GOLDEN-5, improvements in Total scores were observed for glycopyrrolate/eFlow CS and tiotropium (Figure 3b). The mean (95% CI) change in Total score from baseline at week 48 was −3.1 (−4.30, −1.84) for glycopyrrolate/eFlow CS and −4.1 (−5.41, −2.74) for tiotropium; the difference between groups was not statistically significant. The mean (95% CI) change from baseline at week 48 in the Symptoms component was −5.76 (−7.42, −4.10) for glycopyrrolate/eFlow CS and −6.71 (−8.69, −4.73) for tiotropium (Figure 3c). Improvements from baseline at week 48 were also observed for the Impacts (glycopyrrolate/eFlow CS, −2.05 [−3.42, −0.69]; tiotropium, −3.70 [−5.14, −2.25]) and Activity (glycopyrrolate/eFlow CS, −3.43 [−4.90, −1.96]; tiotropium, −3.38 [−5.04, −1.73]) components for both groups. At week 12, a higher proportion of patients in the glycopyrrolate/eFlow CS 25-mcg group met the MCID criteria of responder (46.8%) than the placebo (34.5%) and glycopyrrolate/eFlow CS 50-mcg (41.7%) groups. The odds of response were significantly greater in both glycopyrrolate/eFlow CS groups compared with the placebo group (odds ratio [95% CI]: 25mcg, 1.68 [1.24, 2.28]; 50mcg, 1.36 [1.00, 1.85]). More patients in the placebo group experienced a ≥4-point worsening in Total score than in the glycopyrrolate/eFlow CS groups, and the percentage of patients with no change was generally similar across all groups (Figure 4a). The subgroup analyses showed a higher rate of responders for glycopyrrolate/eFlow CS 25mcg compared with placebo regardless of background LABA use, post-bronchodilator FEV1% predicted, PIFR, or age category at baseline (Figure 5a). 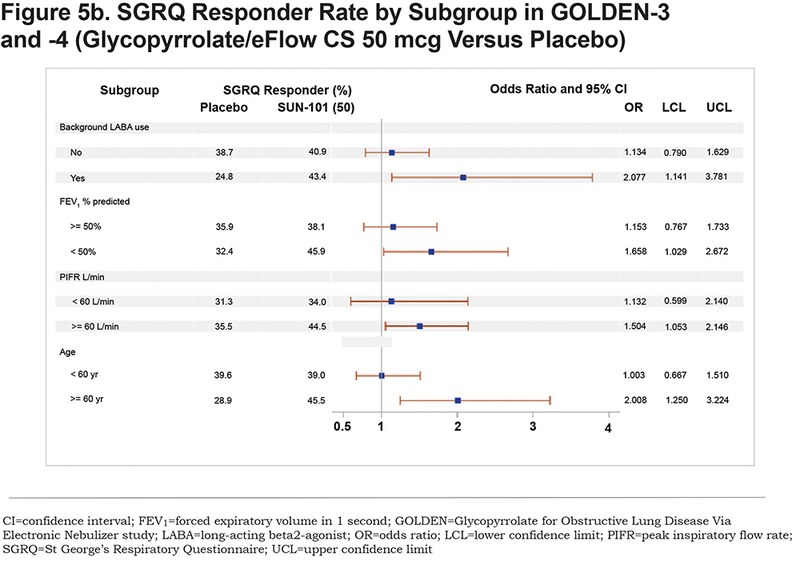 Minor differences among subgroups were seen for SGRQ response in the glycopyrrolate/eFlow CS 50-mcg group compared with placebo, with the odds of response on SGRQ Total score being significantly greater in the 50-mcg group as compared with placebo among subgroups of patients, with background LABA use, <50% FEV1% predicted, PIFR ≥60 L/min, and age ≥65 years at baseline (Figure 5b). In general, SGRQ responders were much higher in both glycopyrrolate/eFlow CS groups compared with placebo among patients on background LABA as compared with patients not on background LABA (odds ratio [95% CI] for the 25-mcg versus placebo groups: 2.30 [1.2, 4.2] in patients with background LABA, 1.4 [1.0, 2.0] in patients without background LABA; odds ratio [95% CI] for the 50-mcg versus placebo groups: 2.0 [1.1, 3.8] in patients with and 1.1 [0.8, 1.6] in patients without background LABA). Overall, the proportion of responders based on MCID criteria was similar between glycopyrrolate/eFlow CS and tiotropium groups. Proportions of responders were 50.1% and 45.4% at week 12, 51.2% and 48.7% at week 24, and 43.7% and 44.5% at week 48 in the glycopyrrolate/eFlow CS and tiotropium groups, respectively. Likewise, the proportions of patients with no change or ≥4-point worsening in Total score were similar between the groups (Figure 4b). 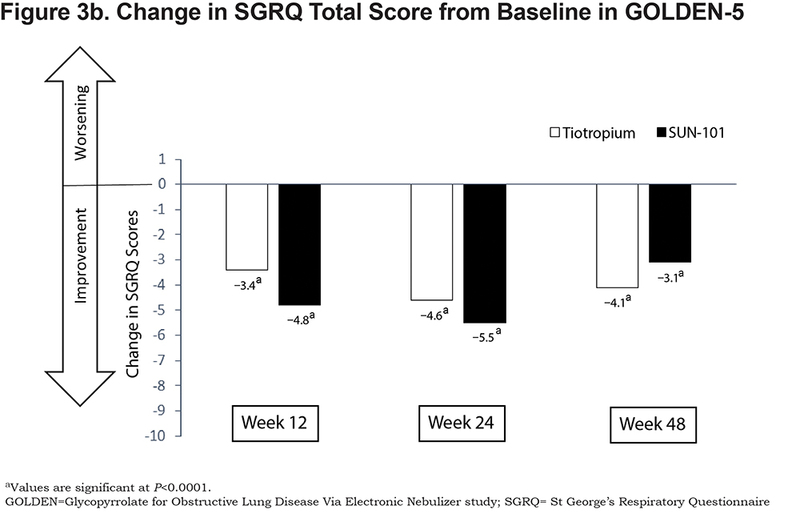 Analysis of the pooled data also showed that deterioration of HRQoL based on SGRQ Total score was lower in the glycopyrrolate/eFlow CS groups as compared with the placebo group at week 12. Additionally, subgroup analyses showed higher response rates in glycopyrrolate/eFlow CS 25mcg (i.e., the approved dose) as compared with placebo among all subgroups by age, FEV1% predicted, PIFR, or background LABA use at baseline. In the pooled sample, a greater reduction in magnitude of response on SGRQ Total score was observed for the 25-mcg dose as compared with the 50-mcg dose, which is driven by the difference in SGRQ responses observed in the GOLDEN-3 study. Although there is a concern that additional symptoms may impair quality of life at higher doses, the pooled studies failed to demonstrate a statistically significant relationship between dose and HRQoL. The higher rate of SGRQ responders among patients on background LABA suggests that glycopyrrolate/eFlow CS may be an effective add-on treatment for patients who are on a previous LABA therapy, although this benefit needs investigation in a future clinical study. Combined with improvements in the primary endpoint and demonstrated safety as discussed in previous publications,30,38 these findings show that nebulized glycopyrrolate/eFlow CS is a safe and efficacious treatment for long-term maintenance therapy in patients with moderate to very severe COPD. Previous studies involving other bronchodilators have shown that improvements in SGRQ Total score were significantly associated with a lower risk for COPD exacerbations, thereby underscoring the importance of SGRQ improvements beyond patient’s health status.39 However, we note that the impact of nebulized glycopyrrolate/eFlow CS in reducing COPD exacerbations directly has not been studied. It has to be noted that glycopyrrolate, as monotherapy for maintenance treatment of COPD is also available in the form of a DPI. The Glycopyrrolate Effect on syMptoms and lung function studies (GEM1 and GEM2) evaluated the efficacy and safety of glycopyrrolate 15.6mcg administered BID via DPI in patients with moderate to severe COPD.36,37 In these trials, glycopyrrolate produced significant improvements in SGRQ Total score and a higher percentage of treatment responders over 12 weeks compared with placebo.36,37 Some differences in patient characteristics between the GEM and the GOLDEN studies are notable. While the GEM studies included patients with moderate to severe COPD, the GOLDEN studies also included very severe patients, with lower post-bronchodilator baseline FEV1% predicted, background LABA use, and high CV risk. Despite these differences in the underlying population, the HRQoL findings in the GOLDEN studies were largely consistent with those observed in the GEM trials. These studies together (n=866 in GEM 1 and 2 and 1293 in GOLDEN-3 and -4) show that treatment with glycopyrrolate may lead to significant improvements in patients' HRQoL. Delivery of nebulized glycopyrrolate/eFlow CS offers an alternative for maintenance treatment of COPD patients who need a nebulized delivery option. Among maintenance treatments available for COPD, currently only LABAs are available for nebulized delivery and hence there is a gap in therapy for COPD patients who may need a nebulized option for a LAMA, either as monotherapy or to be used in conjunction with a nebulized LABA. Glycopyrrolate/eFlow CS may fill this gap in therapy. It is estimated that approximately 45% of COPD patients in the United States may be using a nebulizer,25,26 although most of its use is with short-acting agents, which are only intended for use as rescue medications. The GOLD guidelines recommend use of long-acting bronchodilators for routine maintenance treatment in moderate to severe COPD patients and also upon discharge from hospitalization for better outcomes.1 Nebulized treatments may especially be beneficial for elderly patients and patients who have difficulties with achieving adequate inspiratory flow, coordinating single-breath actuation, or holding breath for the required time after dose delivery.45 The eFlow CS nebulizer uses tidal breathing to deliver an acceptable respirable fraction of glycopyrrolate aerosol droplets into the lung within 3 minutes and is quite portable. The eFlow CS is also designed such that patients can insert the glycopyrrolate drug vial directly into the nebulizer reservoir and hence preparation of the drug is not required, which in turn may minimize dosing errors.27 These attributes of the eFlow CS device are some of the advantages over the traditional jet nebulizers and may potentially improve medication adherence and outcomes in COPD patients. In the GOLDEN studies, the investigational drug/device combination of nebulized long-acting glycopyrrolate/eFlow CS 25mcg and 50mcg, administered twice daily, resulted in significant improvements in HRQoL as measured by SGRQ in patients with moderate to very severe COPD. Nebulized glycopyrrolate/eFlow CS offers a potential alternative option for maintenance treatment of COPD patients. Author contributions: R.T., V.B. and K.R. contributed to the study design. G.F. and E.K. contributed to data collection. All authors contributed toward the data analysis, interpretation of results and drafting and revising the manuscript, and agree to be accountable for all aspects of the work. Heather King, PhD, and Claudette Knight, PharmD, of Percolation Communications LLC (Annandale, New Jersey) provided medical editorial support. Medical editorial support was funded by Sunovion Pharmaceuticals Inc.
Sunovion Pharmaceuticals Inc., provided funding for this research. G. Ferguson receives consultancy and advisory fees from Sunovion Pharmaceuticals Inc., E.M. Kerwin receives consultancy and advisory fees from Amphastar, AstraZeneca, Mylan, Novartis, Pearl, Sunovion, Teva, and Theravance. He has conducted multicenter clinical research trials for approximately 40 pharmaceutical companies. J. Donohue receives consultancy and advisory fees from Sunovion Pharmaceuticals Inc. R. Tosiello, V Ganapathy, and K. Rajagopalan are full-time employees of Sunovion Pharmaceuticals Inc. V. Bollu was a former full-time employee of Sunovion Pharmaceuticals Inc., and currently receives consultancy fees from Sunovion. 1. Global Initiative for Chronic Obstructive Lung Disease (GOLD). Global strategy for the diagnosis, management and prevention of chronic obstructive pulmonary disease: 2017 report. GOLD website. https://goldcopd.org/gold-2017-global-strategy-diagnosis-management-prevention-copd/ Published 2017. Accessed June 2018. 2. World Health Organization (WHO). Chronic obstructive pulmonary disease (COPD). Fact sheet. WHO website. http://www.who.int/mediacentre/factsheets/fs315/en/. Published November 2016. Accessed June 2018. 3. World Health Organization. Chronic respiratory diseases: burden of COPD. WHO website. http://www.who.int/respiratory/copd/burden/en/. Accessed Jne 2018. 4. National Heart, Lung and Blood Institute (NHLBI). Morbidity and mortality: 2012 chart book on cardiovascular, lung, and blood diseases. NHLBI website. https://www.nhlbi.nih.gov/files/docs/research/2012_ChartBook_508.pdf Published February 2012. Accessed June 2018. 5. American Lung Association (ALA). How serious is COPD: COPD prevalence in adults by state, 2015. ALA website. http://www.lung.org/lung-health-and-diseases/lung-disease-lookup/copd/learn-about-copd/how-serious-is-copd.html. Published 2017. Accessed June 2018. 10. Anzueto A, Leimer I, Kesten S. Impact of frequency of COPD exacerbations on pulmonary function, health status and clinical outcomes. Int J Chron Obstruct Pulmon Dis. 2009;4:245-251. 18. Rau JL. Practical problems with aerosol therapy in COPD. Respir Care. 2006;51:158-172. 27. 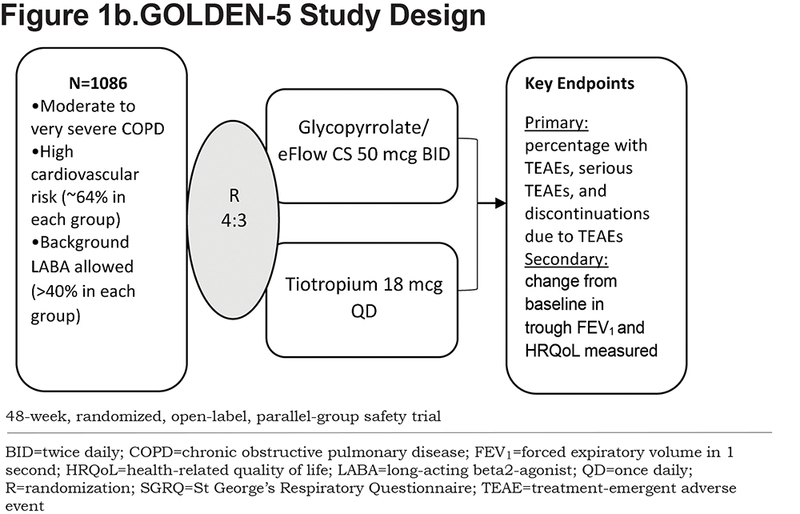 Kerwin EM, Donohue JF, Ferguson GT, Ozol-Godfrey A, Ganapathy V. Patient device satisfaction with eFlow closed system nebulizer: results from the GOLDEN-5 study in patients with moderate-to-very severe chronic obstructive pulmonary disease (COPD). Am J Respir Crit Care Med. 2017;195:A1416. 29. Ferguson GT, Goodin T, Tosiello R, Wheeler A, Kerwin EM. Long-term safety of SUN-101/eFlow® (nebulized glycopyrrolate) in moderate-to-severe COPD: results from the Glycopyrrolate for Obstructive Lung Disease via Electronic Nebulizer (GOLDEN) 5 study. Am J Respir Crit Care Med. 2017;195:A3588. 31. Global Initiative for Chronic Obstructive Lung Disease. Global strategy for the diagnosis, management and prevention of chronic obstructive pulmonary disease-2014 report. Research Gate website. file:///C:/Users/pc/Downloads/GOLD_Report_2014_Jan231.pdf. Published 2014. Accessed June 2015. 32. Jones PW, Forde Y. St George's Respiratory Questionnaire Manual v2.3. 2009. St George’s University of London website. http://www.healthstatus.sgul.ac.uk/SGRQ_download/SGRQ%20Manual%20June%202009.pdf Published 2009. Accessed June 2018. 37. LaForce C, Feldman G, Spangenthal S, et al. Efficacy and safety of twice-daily glycopyrrolate in patients with stable, symptomatic COPD with moderate-to-severe airflow limitation: the GEM1 study. Int J Chron Obstruct Pulmon Dis. 2016;11:1233-1243.